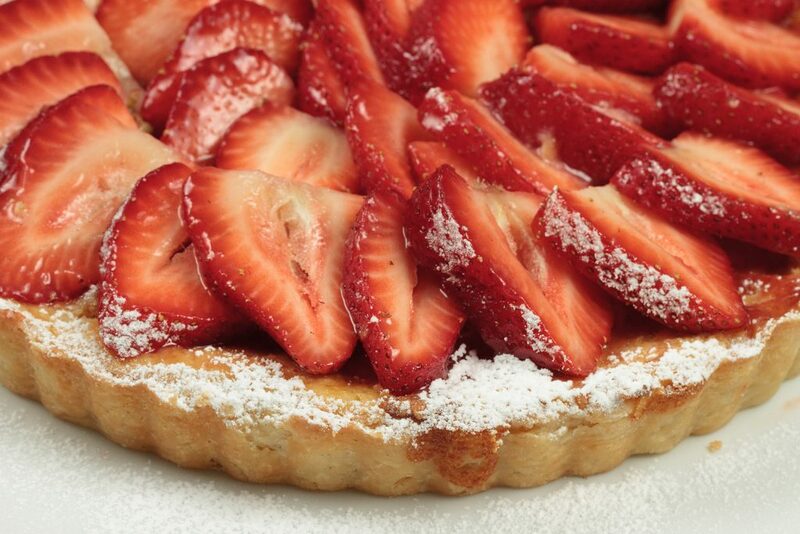 Wouldn’t you love a slice or two of this delicious strawberry ricotta crostata? I think it might be safe to say that I have a strawberry obsession, or at least very well on my way to one. I’m not ashamed, I love strawberries, and I’m beginning to think that they love me too! Those sweet and juicy little bites of heaven, picked at the peak of flavor, just begging to be made into something delicious…….you see strawberries just want to be loved, and to make us happy, what more could you ask of that little berry? So once again thanks to La Cucina Italiana my strawberry obsession continues, and once again we turn to ricotta cheese to help provide the base for those lovely berries. This is not your typical ricotta cheesecake type crostata, I would have to describe it as more of a custard than a cheesecake. The mix contains 4 egg yolks to a scant 1 1/4 cup of cheese. 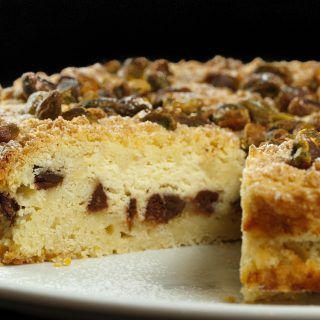 The crust is just a little sweet and oh so buttery, a perfect compliment to the custardy like texture of the filling, one might say a match made in heaven, actually Italy, but for me, that’s close enough! This sweet little crostata is a favorite in our household and if you enjoyed as much as we did you might also like my blueberry peach crostata. 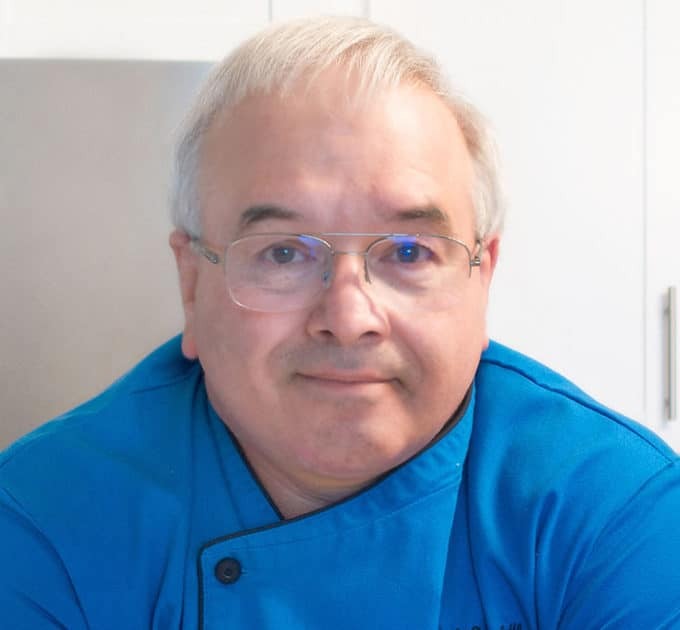 If you’ve tried my Strawberry Ricotta recipe or any other recipe on askchefdennis.com please don’t forget to rate the recipe and let me know where you found it in the comments below, I love hearing from you! You can also FOLLOW ME on Instagram @chefdenniseats and @chefdennistravels, Twitter and Facebook. dump dough into a bowl or on the counter and work it into a ball. 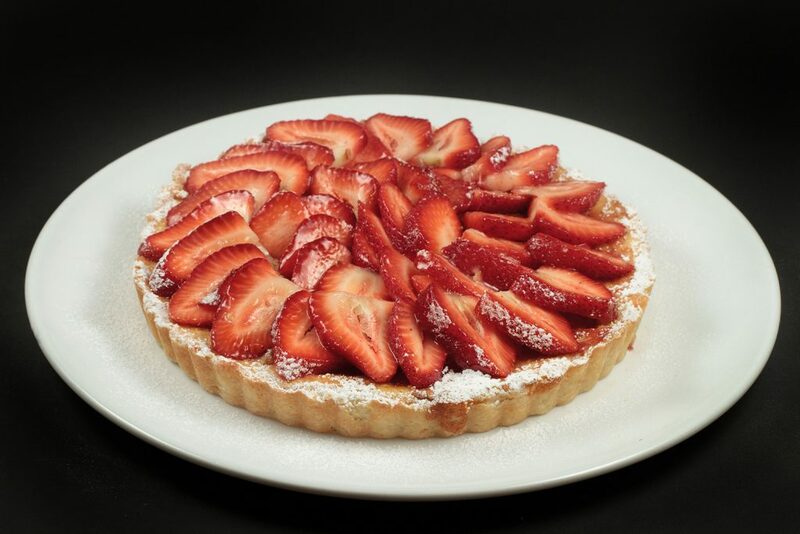 arrange sliced strawberries on the tart in concentric circles , dust the edges with confectioners sugar and remove from tart pan. Prepare to amaze your guests! Thank you for such a wonderful recipe. I made this strawberry delight yesterday for my husband’s grandfather’s 89th birthday (one of many delights on offer) and it was polished off by guests. Making it again for my mother’s 60th this Saturday given it’s absolute delectable perfection! Thank you so much for letting me know that everyone enjoyed the crostata! I hope it goes as well at your mothers party! Chef, this looks yummy, love to try these kind of food items but in my area it is not possible i would like to try it, thanks for the recipe……….. my blog is all about south indian recipes. I completely sympathize with a strawberry obsession, I’m in the same boat 🙂 I made another one of your strawberry cakes before, the mascarpone cheesecake, ant it was absolutely delicious! Now I will have to try this one :-). I have not been to your site as much I would have liked lately, because I was very busy building a website for food bloggers. And now that website is finally live, as of Monday. And I would like to invite you to contribute some of your wonderful posts. It’s a photo based recipe sharing community. The idea is simple: all food bloggers are welcome, all recipe photographs are published within minutes of submission. And, of course, the images link back to the author’s site. Your first paragraph made me smile, your second paragraph made me hungry, and your photos made me a little obsessed with strawberries, too! Fun, tasty post! Dennis, who of us can help having a strawberry obsession when spring comes! 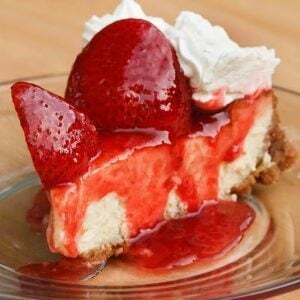 I’ve certainly posted my fair share of strawberry recipes over the last three springs. And doesn’t everything just look better made in a tart pan?! Obsess away! Your strawberry posts have us drooling and waiting, waiting, waiting for our local berries to arrive. I’m not even kidding, just the sound of this made my mouth salivate! 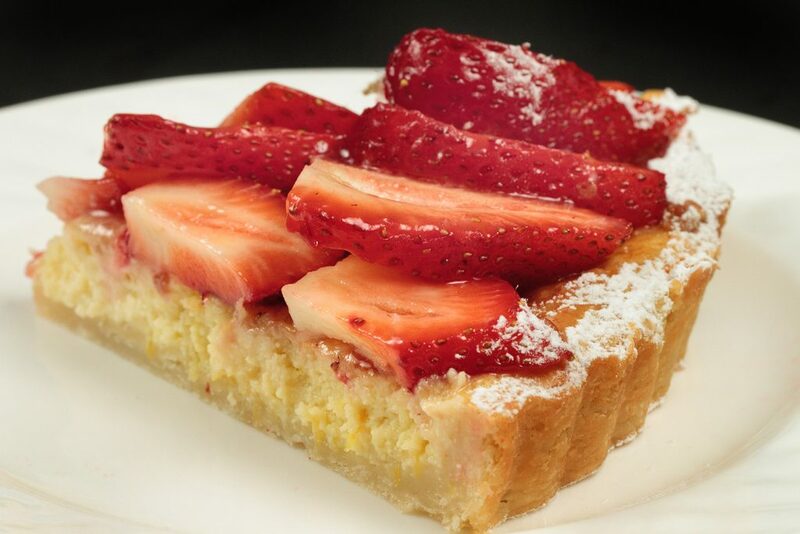 A strawberry and ricotta crostata mmmmm!! 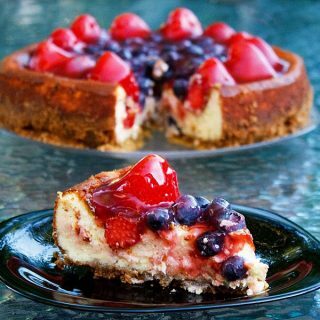 This looks too good to be true 🙂 I love ricotta cheese with fruit, they pair so wonderfully together. And boy does that crust does look super buttery and flaky…I’m sure I could eat just that alone 🙂 This is a beautiful dessert, thank you for sharing it. this is just lovely. lovely, lovely, lovely. Thank you for letting me know, My friend Jean from Lemons and Anchovies made those madeleines for a guest post, I will let her know! Strawberries are one of my favorites too – I look forward to strawberry season more than any other! We JUST got strawberries at the farmers market! This would be perfect to make with them! I’ve been thinking about what I want to eat on Mother’s Day and I think this just made the list! This looks beautiful! I’ve never used ricotta in dessert nor marscapone at all! I really need to broaden my horizons! Looks divine! My cravings for strawberry treats seem to be at its highest during Spring. Your post is just in time. =) Thanks! Your strawberries look incredible! The colors in that first photo are gorgeous. it would be wonderful with mangoes or peaches..yumm Thanks for stopping by and glad to hear you’re enjoying my posts! Looks devine. Adding this to my list of things to make! This looks fantastic – I love the subtle sweetness of ricotta, and this looks like a wonderfully refreshing summer dessert. “There’s nothing wrong w/ that.” LOL I am also addicted to strawberries, and I think there are worse addictions to be had! This is stunning! I’m with you on the strawberry obsession!!! 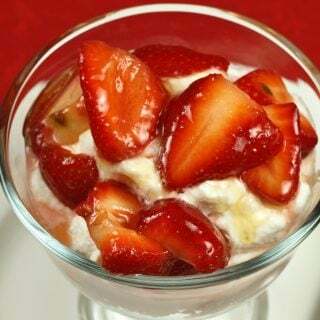 Gorgeous, I love strawberries with ricotta and I have the same strawberry obsession myself! Oh, my… This one is just calling my name! 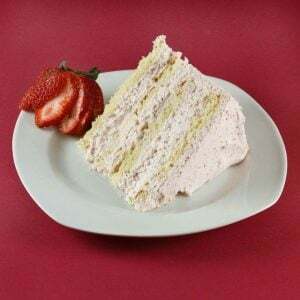 Chef…nothing wrong in loving strawberry…I love cranberry like crazy and have them stashed in the freezer 🙂 Please give me a slice and I wish IT can have this advancement…grab from the screen and have the real thing ! :p ….I will surely grab the whole crostata and not leaving any for your other readers :p oooops how selfish that is…just kidding LOL! I’m a bit behind…I thought your obsession was with squash blossom?! 😀 Strawberries are good too, they are so versatile in many ways! What a piece of work this is, such a beauty too! squash blossoms certainly are an obsession of mine, but since they won’t be out for another month or two, I thought I would compensate by obsessing on strawberries! It is alright to have a strawberry obsession…I have a bit of one myself! How can you not when creating desserts like this?! 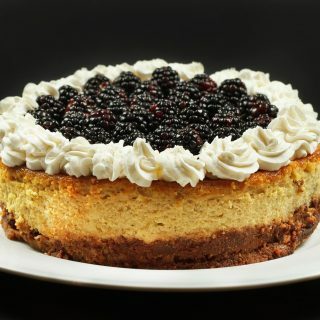 Love this tart, it sounds amazing with the creamy layer underneath and sweet berries on top! Lovely as well :)! This looks incredible! I love ricotta desserts, not too sweet.